Cao Cao is a leader who dedicates himself to his ambitions. A childhood friend of Yuan Shao, he joins him at the Yellow Turban Rebellion and in the Allied Forces. After Dong Zhuo's death, however, Cao Cao disagrees with Yuan Shao and they face one another at Guan Du. Cao Cao wins the conflict and gains Yuan Shao's territory soon after. A few titles also state his army capturing Guan Yu and having the general momentarily serve within his army during this time. Cao Cao often desires to have the brave general to serve him, but he respects Guan Yu's wishes to depart from Xu Chang. As the largest force of power in the land, he then targets Liu Bei and chases him at Chang Ban. His naval fleet suffers defeat at Chi Bi, and Cao Cao's army is crippled from the loss. Even so, Cao Cao is able to rebound from the loss and orders Ma Teng's execution. His order sparks Ma Chao's rebellion and he gathers the regional lords around Quan Zhong to be his allies. In most titles, Cao Cao has the opportunity to speak to Han Sui, and the latter's defection at Tong Gate turns the tides against Ma Chao. With Tong Gate under his control, Cao Cao may participate in Wei's battles at He Fei or Mt. Ding Jun. In most titles, he lives to end either Shu or Wu. In recent scenarios, he may pass away due to illness after the events of Fan Castle. Cao Cao (Meng De), the sons of Cao Song. He was the main characters in Kingdoms of Wei, during the times of Dong Zhuo, he hold as the Prime Minister of Wei. 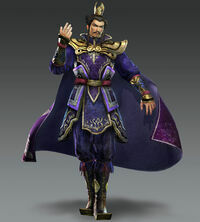 Since after the death of Lu Bu, Cao Cao becomes the Warlord and fear of all general.